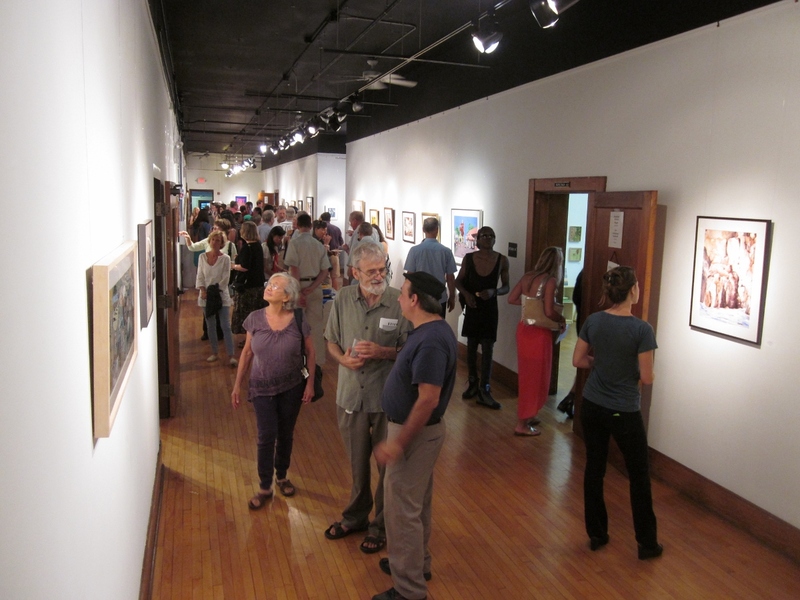 The halls of McGuffey Arts Center were crowded on Friday evening with art lovers who came to view CVWG’s annual exhibition. This photo shows just two of the four halls that were filled with exquisite watercolor paintings. 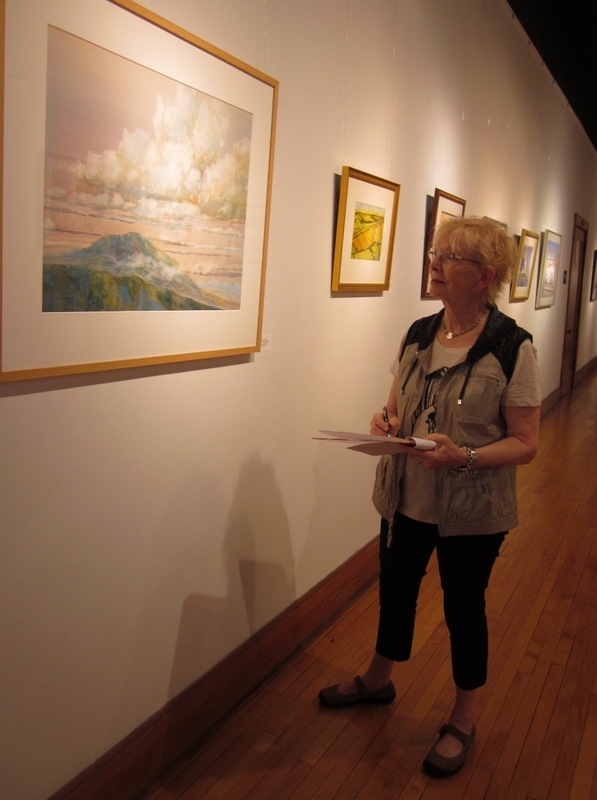 The show was juried by Jan Ledbetter AWS, NWS, shown here making notes in order to select 11 paintings for awards. In the illustrated lecture Jan gave before the opening, she pointed out many aspects of the paintings that attracted her. Notably, the bold use of shapes, skillful brushstrokes, color, and composition. You can see the complete list of awards at the Annual Show page. 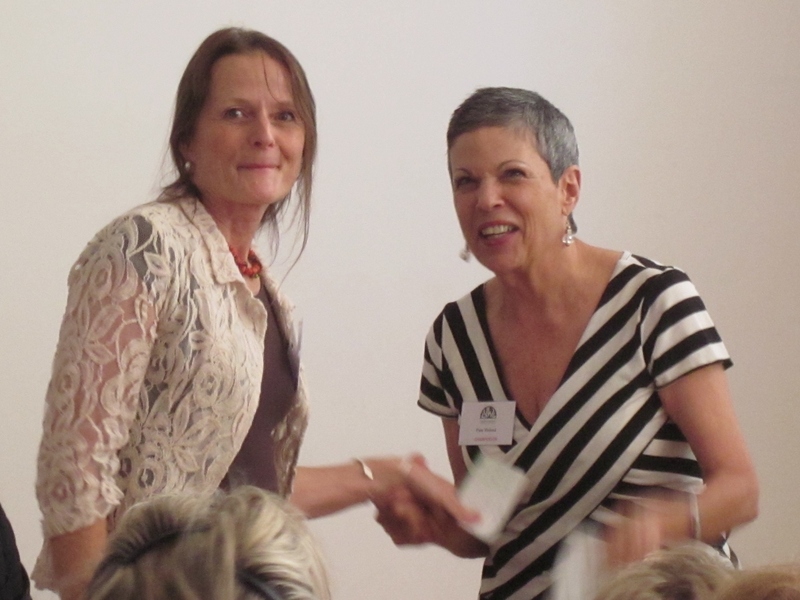 Here the show chairperson, Pam Roland (right), congratulates one of the award winners, Theresa Shepherd, on her painting “Badger Hound”. After the lecture, everyone enjoyed refreshments and conversation in the halls, upstairs and downstairs. We thank the McGuffey Art Center for the use of their beautiful facilities! And a special thanks to Judith Ely and her “crew” for handling the reception. They did a bang up job!! It was wonderful! My congratulations to CVWG for another wonderful show. I was honored to be a part of the exhibit. I brought a guest to the show’s opening and to hear Jan’s presentation and she was equally impressed with everyone’s hard work. Thank you to Pam and her team for a job well done! This entry was posted on Sep 8, 2013 by miatomaine in Local Events, Member news, Shows.